Sprawling dramatically across nine acres of land, high on it's rocky perch above the Northumberland coastline, Bamburgh is one of the largest inhabited castles in the Country. It is also in my opinion the most impressive, both in size and location. It sits some 45 metres above sea level on a natural plateau of volcanic dolerite. The first written reference to a Castle here is 547AD and the Vikings destroyed the original fortification in 993AD. The oldest part of structure that can be seen now (the Keep) was built in 1164AD with stones quarried from nearby North Sunderland that were transported on horseback and by man power. The keep was built with the intention of being impenetrable, with the walls being some 3 - 4 metres thick. The story of Grace Darling has become famous throughout the world and even inspired the song 'Amazing Grace'. It all started in a small Cottage in the Village of Bamburgh, where Grace was born in her grandfathers house on the 24th November 1814, the daughter of a lighthouse keeper. In 1826, as a young girl Grace and her family moved to the newly built Longstone Lighthouse on the nearby Farne Islands, about 3 miles off the Northumberland Coast. The family lived a self sufficient life on the Farne's tending to both crops and cattle on the nearby island of Brownsman. It was for her actions during an exceptionally stormy night in 1838 that Grace would become famous right across the world. At approximately 4am the Steamship 'Forfarshire', on route from Hull to Dundee, ran aground on the rocks of Big Harcar. The ship broke in two and was blown off into the sea Southwards in storm force winds. Soon afterwards Grace spotted the forlorn shop from her bedroom window, but it wasn't for a few hours before she and her father saw survivors clinging for their lives to the rocks. Grace and her Father decided to set off in their family Cobble boat, fearing that life boats from Bamburgh would not be able to launch in such appalling conditions. In all their immense bravery rescued the lives of nine, including a Mrs Dawson who was desperately clinging on to the bodies of her dead children. The news of this heroic act spread quickly across the Country and Grace was showered with awards and invitations to appear at theatres across the land, William Wordsworth even praised her in his prose. Such was her modesty she didn't take up a single offer, nor did she accept a penny of the large sums of money she was offered. Grace eventually died in the Village of Bamburgh at the tender age of 27, despite being treated by the Duchess of Northumberland's best physicians. There is now an effigy of Grace in St Aidan's Church, where she was buried, along with a monument to her everlasting bravery. 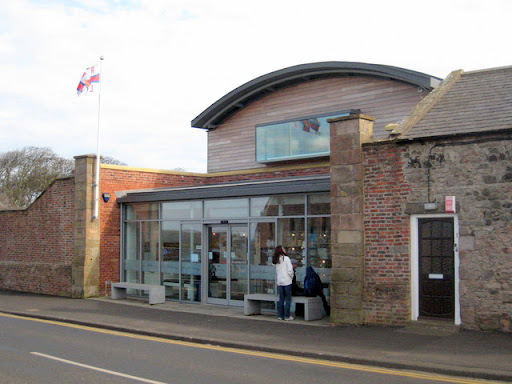 Grace's story is 'amazing' and can be explore in full at the RNLI Grace Darling Museum, which thanks to a Heritage Lottery Fund Grant has had a major rebuild. It is located on Radcliffe Road in the Village and the postcode for your SatNav is NE69 7AE. You can also visit Longstone Lighthouse on the Inner Farne, where Grace lived, as part of a boat trip to the Farne Islands. There has been a church on this site since 635AD when St Aidan was invited to the Castle by King Oswald to establish Christianity in the newly United Kingdom of Northumbria. The original church was wooden and there are now no traces of this structure left apart from a single beam left in the Baptistery. Legend has it that St Aidan was leaning on this beam when he died and it has escaped two fires since. Aidan was the Apostle of Northumbria and also the Apostle of England, making this church the 'mother church' of the Diocese of Newcastle and the centre of Christianity in England. 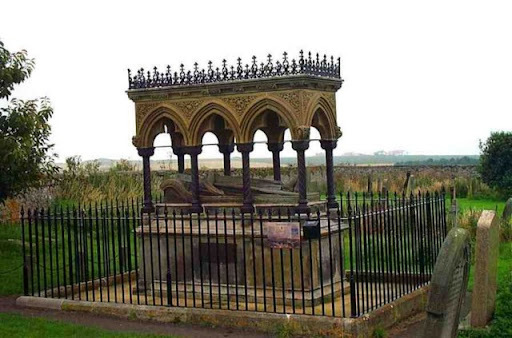 The church now draws a lot of tourist attention because of this and also because of the effigy of Grace Darling inside the church and her grave and memorial outside. The Church welcomes visitors every day from 9am until dusk, visit their website for more information. The Northumberland Coast is designated as an Area of Outstanding Natural Beauty and as such offers some of the best coastal walking in the country. The Northumberland Coast Path runs from Beadnell in the South, through Seahouses and on towards the magnificent Bamburgh Castle in the North. 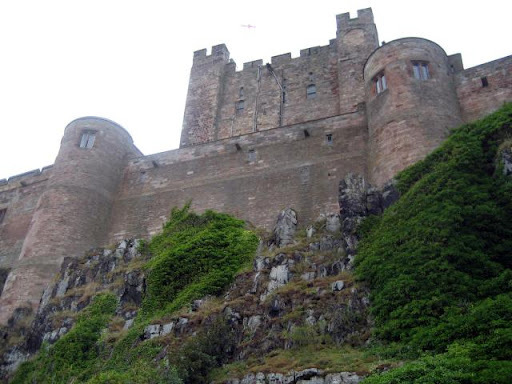 Bamburgh makes an excellent base for walkers, see our Walking page for more information about the Northumberland Coast Path and other walking routes. I can think of three lovely walks to choose from in Bamburgh. The first heads up The Wynding toward the coast from the Village and heading North along the bridleway to the beautiful Budle Bay, popular with bird watchers. The second is a walk from Bamburgh to Seahouses, which is approximately three miles each way. There is plenty to do in Seahouses and many opportunities for refreshments and a bite to eat before heading back, there is also public transport between the two Villages if walking one way was enough! Lastly there is a short circular walk that takes in the Castle, beach and golf course. From the Village head along the far side of the Cricket Green next to the Castle and towards the beach. From here you can walk North along the beach until you reach stags rock (an animal painted on the rocks), from here cut through the sand dunes and onto The Wynding. This road leads you all the way back into the Village. There are also many fine opportunities for cycling from a base in Bamburgh. A popular route is the 21 mile circular route that takes in the Villages of West Fleetham, Bruntam and Embleton before heading off road along the coastline through Low Newton and Beadnell, then back North through Seahouses and back to Bamburgh. Cycles can be hired and delivered to where ever you are staying by the local company Boards and Bikes. For more information about cycling in Northumberland, visit our Cycling page. Bamburgh has it's own 18-hole Golf course just at the North end of the Village. The course offers stunning views across the beaches, countryside and of course of Bamburgh Castle and the Village itself and is often quoted as the most scenic course in Britain. The course is not as long as other courses nearby, at 5,600 yards, it has a demanding par of 68. The course has a clubhouse that welcomes visitors at all times of the year and also serves food. Visit their website for more information and green fees. Other Golf Courses nearby include Seahouses Golf Club, Dunstanburgh Golf Club and heading further south there are two course at Alnmouth. For full information about our County's Golf Courses visit our Golf page. The beach at Bamburgh is popular place for watersports. Not only does it offer the wonderful views of Bamburgh Castle and the Farne Islands, but it is also provides some good waves for surfing through most stages of the tide. Other places nearby that are known to be excellent surf spots include Seahouses beach just to the North of the Harbour and Beadnell Bay, just a few miles to the South. Northside Surf School offer beach surf lessons on several beaches along the Northumberland Coast including Bamburgh. Courses start at 2 hours and go up to 5 days and are run by Jon Nolan, a British Surfing Association Coach and an RLSS Beach Lifeguard so you know you're in safe hands. They operate 7 days a week and 12 months of the year and cater for all needs. If you need any equipment to have a go at any watersports then the company to get in touch with is Boards and Bikes. They supply and hire wetsuits, boards and bikes to the Beadnell, Seahouses and Bamburgh area. They will even deliver them to wherever you are staying, be that a B&B, Hotel or caravan. They don't just hire equipment, they also run excellent value lessons on the beaches of Bamburgh, Seahouses and Beadnell. They start from 2 hours and include a full safety brief before allowing you in the water as safely as possible with their skilled and friendly teachers. Bamburgh has many leisure facilities, including a Tennis Court. Hire of the court is just £5 per hour with an additional key deposit of £5. The court is available to book from the reception of the Victoria Hotel, where you also collect and return your key. The Cricket Green in the shadows of the Castle walls has been used since the 1800's. Matches are usually played on a Sunday afternoon, which just adds to the character of this wonderful little Village. If you are interested in playing while you visit Bamburgh you can email the club and they will try and accommodate you, for contact details visit their website. The Cricket Green is also home to Bamburgh's Croquet Club, what better location to enjoy this traditional game? Visit their website for more information.